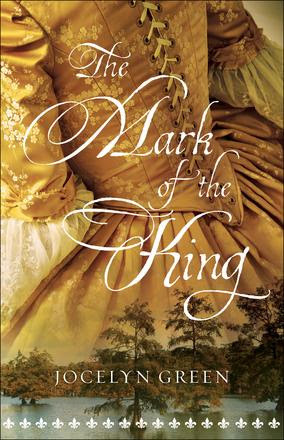 You’ll be on the edge of your seat as you take the journey to the fledgling 1720s French colony of Louisiana in Jocelyn Green’s new book, The Mark of the King. After being imprisoned and branded for the death of her client, twenty-five-year-old midwife Julianne Chevalier trades her life sentence for exile, where she hopes to be reunited with her brother, serving there as a soldier. To make the journey, though, women must be married, and Julianne is forced to wed a fellow convict. With her dreams of a new life shattered, Julianne must find her way in this dangerous, rugged land, despite never being able to escape the king’s mark on her shoulder that brands her a criminal beyond redemption. So many times I've been pulled in by a gorgeous cover only to be let down by a complete disaster of a story house between it. Thankfully, I'm happy to report that is not the case with The Mark of the King by Jocelyn Green. The cover has got to be one of the best of the new year, and the story is pretty good too. Having never read a book by Ms. Green, but having read a few rave reviews for some of her previous works, I decided to take the plunge. 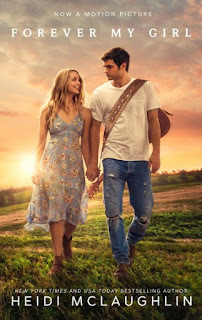 Not only is the cover unique for the Christian fiction genre, but the setting is too! It's not everyday one comes across a tale that's set in a place and during a time that was such a pivotal period for the south. 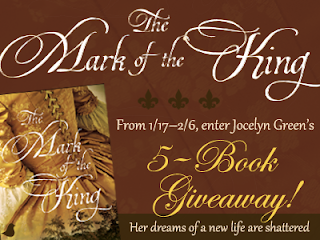 French, British, Spanish, and Native Americans were all at odds, trying to gain the upper hand and Jocelyn Green presents a story of what could have been in The Mark of the King, story of French born Julianne Chevalier. Julianne's story is certainly one of woe. Wrongly accused of the death of a client in France, she is branded a criminal and married off to a fellow exile and shipped to New Orleans. Her life is completely turned upside down in just a few month. The wild, untamed bayous don't pose as much of a threat to her as the "gentlemen" of the settlement. After another tragedy threatens to upend the fragile life that she has made for herself, she finds help where she least expects it. Marc-Paul Girard is determined to do right by his king, country, God, and Julianne. The danger that both face from enemies unseen is very real. Jocelyn Green paints a vivid picture of what life in early New Orleans may have been like. Green pens in just a few glimmers of light to brighten what would otherwise have been one tragic story. Everything that could go wrong, does go wrong and you can't help but hope Julianne's granted some peace! That makes her easy to root for. If any of Ms. Green's previous novels resonate the way this one has with me, I've really been missing out! The Mark of the King is an A-1 Christian historical! Renee, I'm glad this book lived up to its cover. As usual, your review is wonderfully written.